Top Ideas for Transitional Design | Le Gourmet Kitchen Ltd.
new kitchen design is an exciting and sometimes daunting endeavor. With the right planning and help from experienced design professionals, you can achieve the dream space you always wanted. 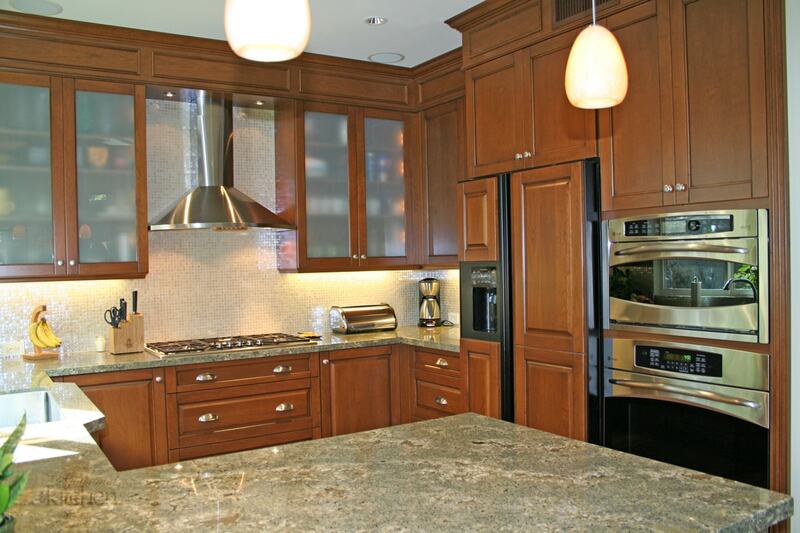 There are many reasons why it may be time for a kitchen remodel in your Orange County home. Perhaps your appliances and storage are outdated or no longer suited to your family’s requirements, or maybe your design no longer matches your personal style. Whatever your reasons, a kitchen renovation can breathe new life into your home and change the way you use your home living spaces. Think of your floorplan as a blank slate onto which you will put the appliances, sink, countertops, and cabinetry that all work together to create a design unique to you. These elements, along with your color scheme and accessories define the style of your room. Are you looking for a contemporary edge with clean, sleek lines? Or a more traditional style with ornate details and a homier appeal? Maybe you are looking for both, in which case we have the perfect answer for you: transitional kitchen design. 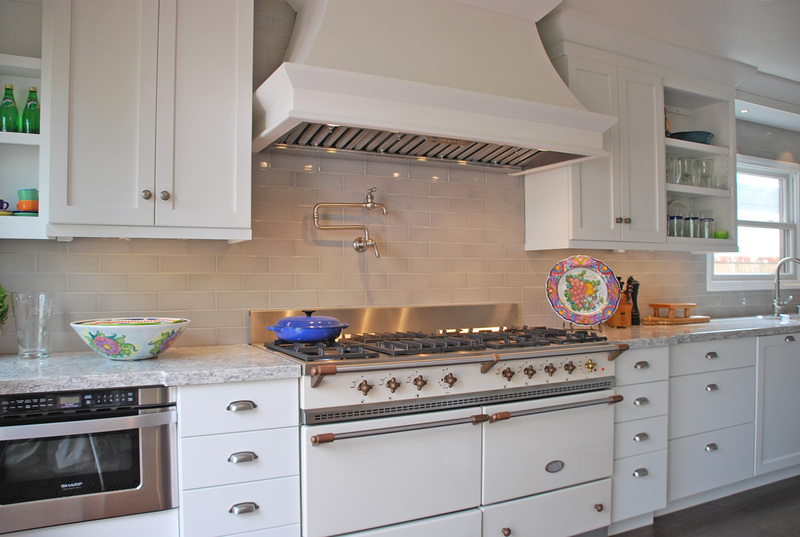 What is transitional kitchen design? Transitional design offers the perfect middle ground between the clean appeal of contemporary design and the warm comfort of traditional styles. This design style allows you to update classic traditional design and create a more timeless style that delivers the best of both worlds. Here are some of the key elements to consider in a transitional design. Cabinetry in transitional design typically brings together the natural or painted wood finishes of traditional styles with a more streamlined door. Shaker style cabinets are very popular for transitional kitchens due to their simple paneled doors that lack extra ornate features but are not as plain as more contemporary styles. Natural materials such as hardwood floors or granite countertops are ideal for transitional kitchens as they add warmth and texture to the typically neutral color palette. Man made materials like quartz countertops and porcelain wood look flooring work very well too. Make sure your countertops stick to a simple edge and avoid other detailing that strays back into the traditional space. A neutral color scheme achieves the transitional style and gives your design a timeless appeal. This does not mean you have to go for an all-white kitchen remodel. Pull together a neutral color palette with different tones that work together, include a kitchen island in a contrasting tone, or add warmth with a contrasting backsplash. Transitional design also relies on texture to add visual interest to a neutral color scheme, such as by using textured (but still neutral toned) backsplash tiles. You can add a pop of color in a transitional kitchen design but keep it simple. Part of the appeal of transitional kitchen design is the clean lines and clutter free appearance, so make sure you do not detract from that with over-the-top accessories. Keep artwork, countertop or tabletop arrangements, and displays on open shelves simple. Perhaps pick a favorite accent color, and make sure your accessories stick to this color scheme. Likewise select cabinet hardware with simple lines that will beautifully accent your kitchen cabinets without overpowering their simplicity. Does the transitional style sound like a perfect choice for your next Orange County kitchen remodel? 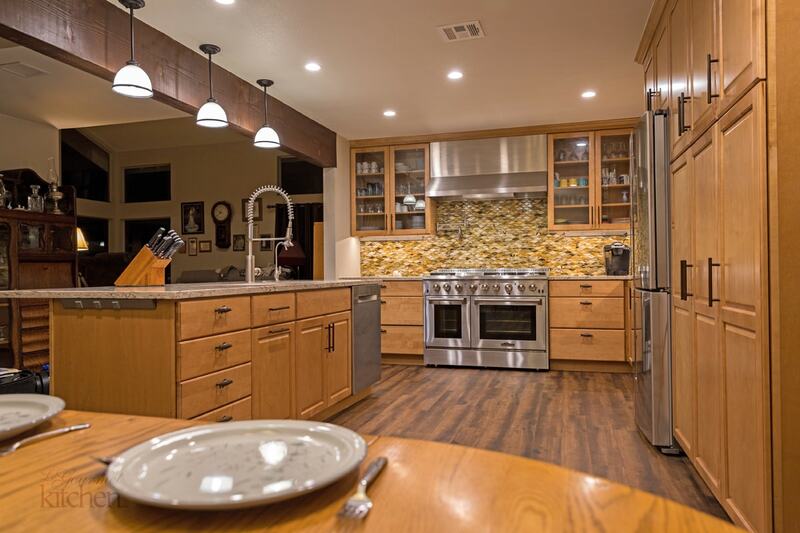 Check out more ideas in our kitchen design gallery and then contact us on (714) 939-6227 to get started on re-imagining your home living space.